I wanted to like whiskey. bourbon. rye. blends. And thanks to a brilliant Manhattan made at Elemental in Seattle: I was finally ushered in the door. I finally 'got it.' And for a gal who claims to wield martinis, well, earning my bourbon badge was a high priority. Suffice it to say, Manhattans have topped my personal chart: they are now my favorite go-to martini, complete with homemade brandied cherries. When I am determined to nail a flavor profile of a particular martini, I taste taste taste. You know how snotty I got with my sidecars---and it became difficult to order out margaritas and mojitos. When you make them better than the bartender, well, you are only setting yourself up for disappointment. I knew I was onto something when I had a Manhattan at a well-regarded restaurant and kept wincing b/c it was heavy on the bitters. And I noticed. Which---though my drink wasn't that great---made me happy. 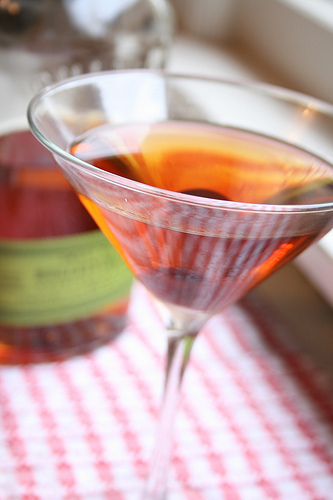 How to make a great Manhattan. Or should I say how to learn to make any great martini? Taste. Taste. Taste. Wince a bit, gargle if you must, be unafraid. I bought the little bottles of different brands of Kentucky this, Tennessee that, bourbon, rye, whiskey, mash. I picked up my Bourbon cookbook (I know, right? Cool.). I asked about blended, mixed and small-batch. Fancy labels, boring labels, cool bottles or not. I inquire: what do you like? What is the difference? What do restaurants buy? What do you think of this one? I watch bartenders like a stealth hawk. So far, this is my synopsis: Maker's Mark is classic for a reason. Yum. But it is a tad pricey. I find myself reaching for Old Overholt and Bulleit Rye time and again. They are smooth yet sturdy, complex enough for the price, not sickeningly sweet---both keepers. Forgive me for any inaccuracies, but you know I measure mentally---not physically---when making martinis. So here are the mental ratios I pour: 3/4 rye, 1/4 red vermouth and 2 drops of bitters. Bitters are a new found love---more on that later---ideal when added in infinitesimal amounts. (When it comes to bitters, you really can have too much of a good thing). My brother is religious about how he makes his Manhattans (which I respect tremendously): chilled glass, muddled with ice, RYE only plus sweet vermouth, a tiny splash of dry vermouth and an orange twist. Twist goes in glass first; strain chilled drink into glass.